CREATE GENERATIONS OF MEMORIES AT THIS MASTERPIECE LOG ESTATE ON 40 ACRES WITH 1100+ FEET OF LAKE SHORE, JUST MINUTES FROM DOWNTOWN HAYWARD. THIS ONCE IN A LIFETIME . 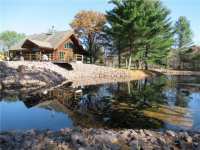 . .
CHIPPEWA FLOWAGE--SPECTACULAR CUSTOM LOG HOME ON MOORE'S BAY OFFERS THE BEST OF ALL WORLDS: EXCEPTIONAL DESIGN & QUALITY, 424 FEET OF LEVEL SHORELINE, AND STUNNING . . . LOOKING FOR A CORPORATE RETREAT, FULL-TIME OR VACATION HOME FOR FAMILY AND ENTERTAINING? 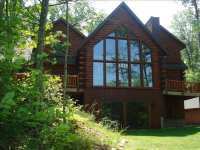 THIS RED CEDAR LAKE HOME IS UNLIKE ANY OTHER WITH ITS EXQUISITE CRAFTSMANSHIP . . . 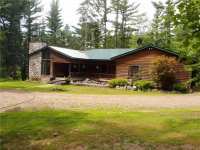 MAGNIFICENT LONG LAKE ESTATE WITH 31 WOODED ACRES FOR THE ULTIMATE IN PRIVACY AND NORTHWOODS BLISS! 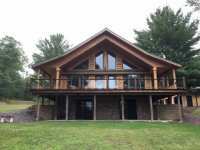 THIS GRAND LOG HOME FEATURES INCLUDE:STONE FIREPLACE, LOG BEAMS IN . . . THERE IS NOTHING LIKE THE RUSTIC CHARM OF AN AUTHENTIC, FULL-LOG HOME & THIS ONE IS A BEAUTY. MAJOR RENOVATING HAS BEEN UNDERTAKEN IN LAST 2 YEARS: KITCHEN, LIVING ROOM . . . 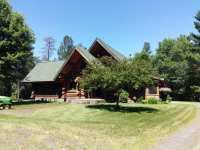 CUSTOM BUILT, HAND CARVED 18" DEAD STANDING PINE LOG HOME ON LOW ELEVATION PRIVATE LOT AT THE END OF THE CUL-DE-SAC. SOUTH EASTERLY BIG LAKE VIEW AND SANDY BOTTOM AT . 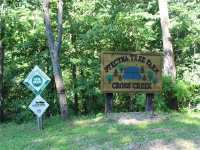 . .
CROSS CREEK RANCH IS LOCATED IN THE SECLUSION OF THE VALLEYS OF THE DRIFTLESS REGION OF WI. THIS IS TRULY A ONE OF KIND PROPERTY WITH A TOTALLY AND NEWLY REMODELED . . . 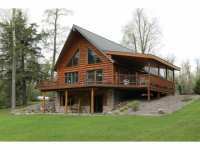 CUSTOM BUILT ONE OF A KIND TOMAHAWK LOG HOME! MUST SEE - ALL HIGH END AMENITIES. DETAILS TO FOLLOW SHORTLY. SQUARE FOOTAGE IS BEING VERIFIED. 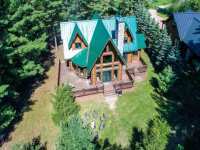 CHARMING IMPRESSIVE 3 LEVEL 4 BEDROOM FULL LOG CHALET HOME NESTLED IN A NORTHWOOD SETTLING MAJESTIC PINES NEARLY 18 ACRES PARCEL ON A DEAD END ROAD WITH TRAILS THRU OUT . 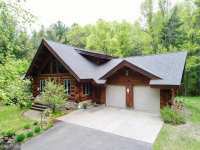 . .
GORGEOUS CUSTOM BUILT HOME ON PRIVATE 5+ ACRES JUST MINUTES FROM WAUSAU. 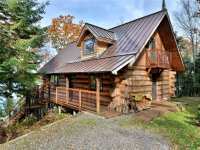 TIMBER CONSTRUCTION INFLUENCED BY LOG HOMES WITH REPURPOSED BARN BOARDS, 8" THICK WALLS AND . . . 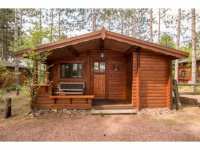 THE CHARMING WARMTH OF THIS EXQUISITE FULL-LOG CHALET INSTANTLY WELCOMES YOU! PRIVATE, SOUTHERLY SETTING ACCENTUATES THE PARK-LIKE GROUNDS, LAKESIDE DECKS &AMP; SANDY . . .
WELL-KEPT 1/2 LOG HOME WITH 2X6 CONSTRUCTION ON A PRIVATE SETTING ON ALEXANDER LAKE. OUT IN THE COUNTRY BUT NEAR TO TOWN. THIS CLEAN, CLEAR LAKE ISNÂ?T OVERLY CROWDED. . . .
WELL-KEPT 1/2 LOG HOME WITH 2X6 CONSTRUCTION ON A PRIVATE SETTING ON ALEXANDER LAKE. OUT IN THE COUNTRY BUT NEAR TO TOWN. 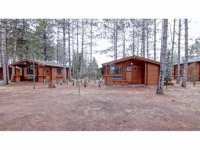 THIS CLEAN, CLEAR LAKE ISN�T OVERLY CROWDED. . . .
LOG CABIN LIVING AT ITS BEST! 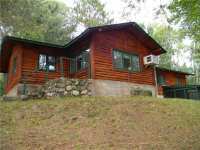 THIS STUNNING, HAND SCRIBED LOG CABIN IN THE NORTHERN WOODS OF WISCONSIN HAS BEEN METICULOUSLY CARED FOR AND OFFERS YEAR ROUND ENJOYMENT . 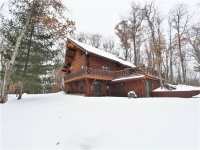 . .
1600 SQUARE FOOT FULL LOG HOME SITTING ON 80 ACRES OF PHENOMENAL HUNTING PROPERTY. 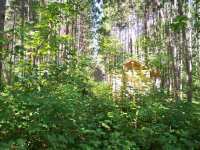 HOME IS CONSTRUCTED WITH 9 INCH DIAMETER LOGS, HAS INSULATED FLOORS, WOOD STOVE HEAT . . .
PRIVACY, SECLUSION AND WATERFRONT ALL WRAPPED UP INTO ONE PACKAGE. 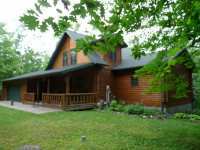 THIS 3 BEDROOM LOG HOME SITS IN A QUIET BAY ON ELLSWORTH LAKE WITH OVER 680 FT.OF FRONTAGE. TURN KEY . 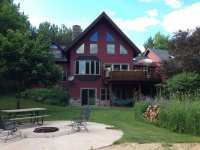 . .
URN KEY NORTH WOODS HOME SETTLED ON APPROX 5.6 ACRES WITH APPROX. 630 FT ON LAKE GALILEE. THIS HOME FEATURES 3 BEDROOMS 3 BATHS ATTACHED 2 CAR GARAGE WITH ADDITIONAL . . . 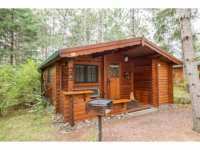 STUNNING LOB CABIN LOCATED ON BIG SAND LAKE! IF YOU ARE LOOKING FOR PRIVACY, RESPITE, AND BEAUTIFUL SURROUNDINGS, YOU HAVE FOUND IT! ENJOY THE SANDY BEACH &AMP; CLEAR . . .
CLEAR GILMORE LAKE WITH 210' OF SANDY FRONTAGE WITH SOUTHERN EXPOSURE. PRIVACY & NATURE TOGETHER ON 6.6 ACRES OF WOODS. TAMARACK LOG HOME...DOES NEED SOME TLC. CLASSIC . . .
CLEAR GILMORE LAKE WITH 210' OF SANDY FRONTAGE WITH SOUTHERN EXPOSURE. 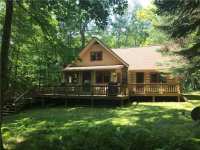 PRIVACY &AMP; NATURE TOGETHER ON 6.6 ACRES OF WOODS. TAMARACK LOG HOME. DOES NEED SOME TLC. . . .
BEAUTIFUL LAKE CABINS! 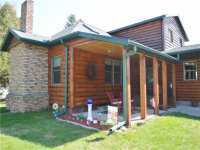 CONDOMINIUM UNIT SITUATED IN A COZY LAKESIDE SETTING ON LAKE HAYWARD. UNIT IS WITHIN WALKING DISTANCE TO DOWNTOWN HAYWARD, CLOSE TO SNOWMOBILE . 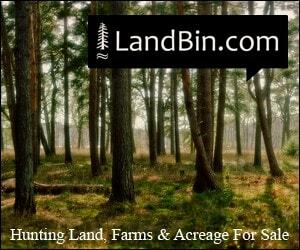 . .
As a member of virtually every MLS in Wisconsin & Minnesota, our experienced real estate agents have access to more WI log homes for sale than any other company. Let us be your guide. 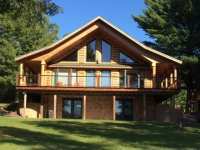 You probably found our "Wisconsin Log Homes For Sale" page the same way all of the active, qualified buyers do. 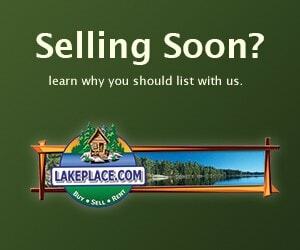 List with us today and let us put the power of LakePlace.com to work for you. It was the late 18th century. While the United States of America was in its infancy, the cities and communities along the eastern seaboard were already bustling centers of commerce. As a society, we started to look toward the west for ways to expand our new, fledgling nation. In 1783, the United States acquired the territory that we now know as the great state of Wisconsin. Shortly thereafter in 1787, Wisconsin was officially placed in the Northwest Territory, a land previously inhabited by Native Americans and European fur traders. Until the War of 1812, Wisconsin was effectively controlled by British forces in spite of the fact it was officially under the control of the United States. Looking westward, the climate of Wisconsin had so much to offer new, intrepid settlers after the War of 1812. Land here was plentiful for living and farming. There were countless lakes and streams brimming with fish. Wildlife for fur trapping and hunting roamed the forests. The forests themselves were an incredible natural resource for lumber and paper. While the winters were cold, summers were mild and pleasant. Overall, Wisconsin was an ideal climate for countless European settlers looking to make a new life for themselves on the new American frontier. As settlers moved into the region, it became necessary to establish more permanent communities for their families. Looking around at the surrounding region, wood and lumber were one of the most plentiful natural resources from which to construct their new homes and businesses. Log cabin construction was easy, sturdy, and reasonable for the settlers of the North Woods and such structures began springing up across the Wisconsin territory. Generally log home construction falls into two separate techniques. Traditional WI log homes are constructed with long pieces of logs stacked upon one another with notches or grooves cut into the ends so that the logs stack neatly and safely. The cracks between the logs are then filled in with mud, cement, or other similar substance to add security to the wall and to insulate the home so that the occupants of the log cabin do not freeze in cold temperatures. 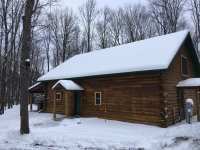 The other primary WI log home construction technique is commonly referred to as stack wall or cord-wood construction. These consist of smaller pieces of logs the length of which determines the thickness of the walls. These pieces are stacked up on top of one another with the cut ends appearing as the walls of the home. Constructing a cabin out of these smaller pieces is ideal because the smaller logs are less expensive to obtain and much easier to maneuver due to their smaller size and weight. 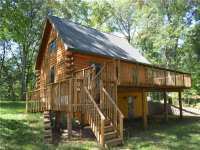 Log homes can be constructed out of a variety of types of woods. Wisconsin log cabins are most commonly built out of cedar or the plentiful white pine trees founds in the North Woods. Early Wisconsin settlers utilized log cabin construction due to the reasonable, plentiful lumber and the sturdiness of the structures. Not only was this method of construction used in this historical context, log home construction has withstood the test of time and is a common method of construction to this day in the magnificent North Woods of Wisconsin. While the concept has remained the same, log home construction has been improved significantly over the course of the past two hundred years. Today's Wisconsin log homes bear little resemblance to the basic, dirt floored structures that our settler ancestors might have constructed. Modern methods include techniques for insulation, self-sufficiency, "green" building techniques and luxurious upgrades that would have been unthinkable a hundred years ago. Construction mediums can be blended in such a way to create gorgeous log homes with other natural highlights such as rocks, granite, glass, tile, copper and even stainless steel to create some of the most spectacular homes to be found in the North Woods. 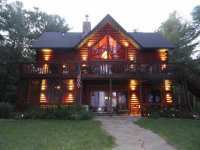 Fabulous amenities such as exterior kitchens with wood fired ovens, expansive decks, in-ground pools, hot tubs and fabulous landscaping complete with blooming native flower gardens and waterfalls, are but a few of the highlights of some of the most beautiful log homes to be found in the state of Wisconsin. In times past, WI log cabin interiors were typically rustic, with the logs exposed as the interior walls of the home. Today's Wisconsin log home interiors are as fabulous as the exterior features described above. The interior walls can be created out of rich natural timber, sheet rock or a variety of other construction mediums. Furthermore, just because you have a log home doesn't mean you need to decorate with country flowers and moose. Many modern log homes feature beautiful stream-lined, sleek interior design to maintain the convenience of modern living without giving up the traditional coziness of a log cabin. 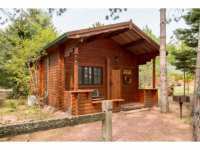 If you have ever contemplated owning a log home in Wisconsin, consider all the possibilities. Pre-existing log cabins can be a terrific investment, particularly for those willing to roll up their sleeves and put a little sweat equity into a home needing a little sprucing up. 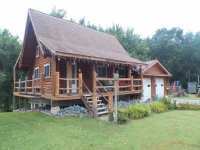 Log homes in Wisconsin can be quite affordable for many families. Modest fixer-uppers can be found in the $100,000 range. 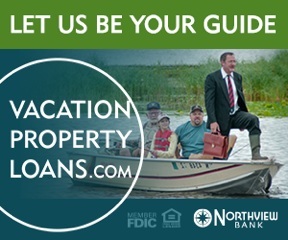 For those with larger budgets, buying a lakefront piece of property and constructing your own vision is another option. 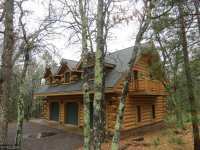 Pre-existing luxury log homes can be found throughout the state as well. Prices on such homes can range from $200,000 on up to millions of dollars, depending on the location, amenities and condition of the property. No matter what type of log home you are interested in, make sure you secure the assistance of a knowledgeable and reputable real estate professional to help you in your quest. 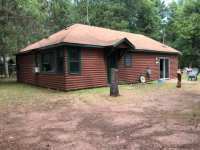 The agents at LakePlace.com are always happy to provide you with the highest quality assistance in locating your perfect piece of the North Woods here in Wisconsin. 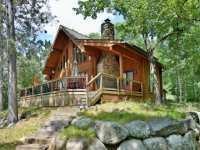 Even if the purchase of a log home doesn't appear to be in your immediate future, it is still possible to experience the joys of log cabin living on your next vacation. 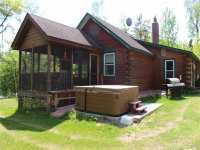 Log cabins can be found available for rent throughout the Wisconsin region, allowing folks to experience the beauty of the area without investing a large sum of money in a single property. Rentals are often available on a per night, week or month basis, depending on the amount of vacation you have saved up. This can be a reasonable way to experience the joy of truly relaxing in the beauty of the outside world on your vacation instead of running around in a hot sweaty amusement park, exhausted and waiting in line. 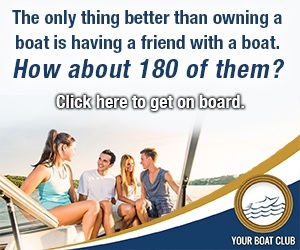 Once you have experienced the peace of cabin vacationing, you are almost certain to want to return year after year to refresh and rejuvenate yourself during your family's annual vacation. Today, people moving into the North Woods of Wisconsin continue to seek log homes as a result of their aesthetic appeal and practicality. Furthermore, people seek these types of home as they hearken back to a simpler way of life from times past; a time when people were able to immerse themselves in the beauty of the natural world without the trappings of the concrete jungles we are all too familiar with in our daily lives. In a modern log home, people can immerse themselves in the tranquility of the forest along the shores of a lake without sacrificing modern comforts and conveniences. It is difficult to imagine a morning more ideal than sitting out on the back deck of a log cabin with a cup of coffee, a blanket and the mist rising off of the nearby lake, or an evening more ideal than a roaring fire in the fireplace, laughter of friends and family and a cup of hot cocoa in your very own log home. 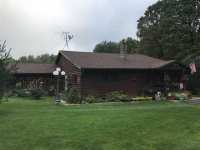 Wisconsin is a state ideally suited for the log cabin home as a result of the rich natural forests, temperate climate and plethora of outdoor activities. It is a region that naturally lends itself to outdoor living and for those averse to camping, log homes are the perfect alternative. Countless people maintain log cabin homes in the North Woods of Wisconsin so that they can come and experience the beauty of the area year after year on their family vacations. Imagine emerging from the peace and tranquility of a log cabin after a great night's rest. Breathe in the fresh scent of the pine forest. Walk down to the lake for a few hours of fishing; a respite from the insanity of our everyday lives. Swim, hike or boat away the afternoon. Hunt for game in the height of deer season. Or, visit a local community such as Siren, Spooner, Hayward, Birchwood, Chetek or Cable for a leisurely afternoon strolling through the local shops and visiting the local dining establishments. At night, return to your log home to relive the day over a roaring fire. There are few pleasures in life this simple. Even in winter, the countless activities just outside the doorstep of your log home will astound you. Snow-mobiling, ice-skating, hunting, hiking and ice fishing are but a few of the outstanding outdoor pastimes of a North Woods winter. Best part about a day of outdoor winter fun? Relaxing in front of the fire at the end of the day. 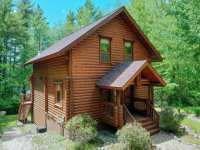 Renting or owning your very own Wisconsin log home can make all of this a reality for you and your family. Why wait? 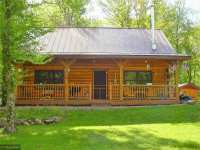 Explore the Wisconsin log homes available on LakePlace.com today!